Architects (UK) have signed to Epitaph and the band is recording a new album to be released in Spring 2014. UK TOUR!! EUROPEAN TOUR! NEW LABEL! NEW ALBUM!!! We’re delighted to announce that we have signed to Epitaph Records! Its an absolute honour to join a label that houses the best roster in the genre. We’re also stoked to have signed deals with UNFD in Australia and New Damage Records in Canada. This is a whole new chapter for Architects and we’re stoked to have such a great team behind us. Many of you will have seen that we are currently in Gothenburg at Studio Fredman recording a brand new album that is penciled for a spring 2014 release. Its sounding splendid - ya gonna love it. 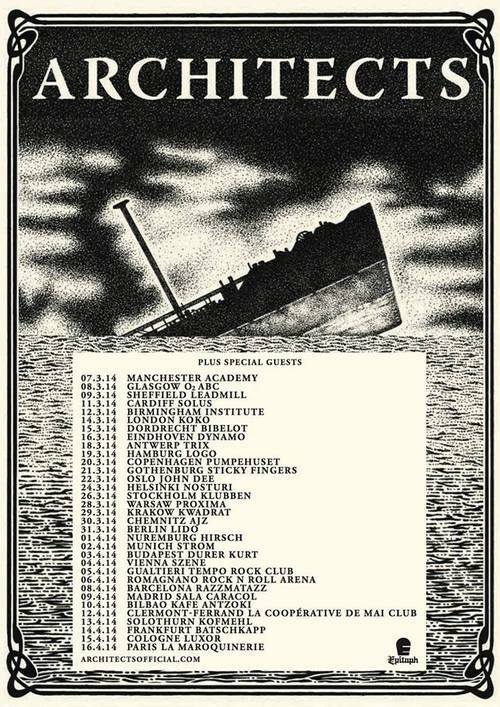 LASTLY - we will be embarking on a UK and European headline tour in support of our new record! We can’t wait to get back out on tour!!! Ticket details to follow…..